I’ve lived in Oregon for 75% of my life. I know it’s pretty. But like gum stains on the Walmart parking lot or graffiti on boxcars, at some point things become so commonplace that I don’t really notice them anymore. It’s springtime in Oregon, one of the prettiest things there is. And I’ve been taking it for granted. 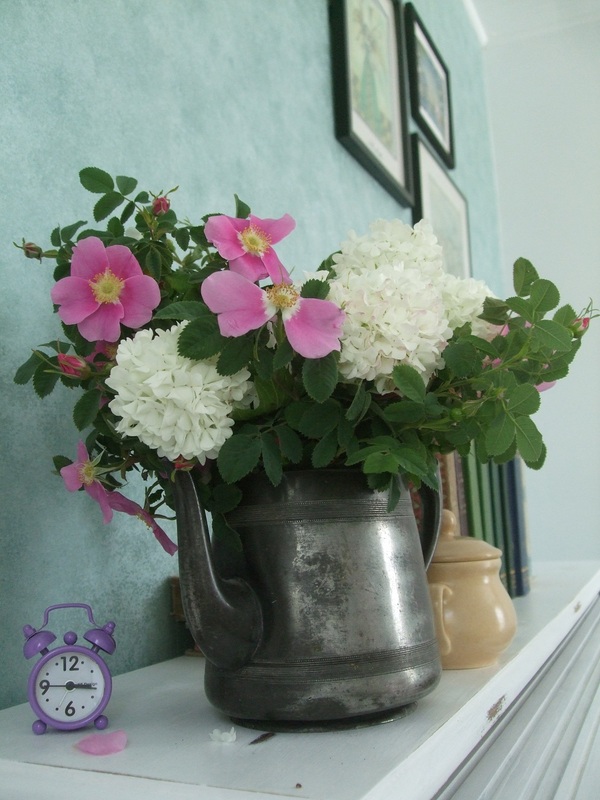 I decided that this must stop, and I was going to go out and pick a bouquet of wild roses and snowballs, and I was going to take pictures and blog about it no matter how Ann Voskamp-ey it turned out. 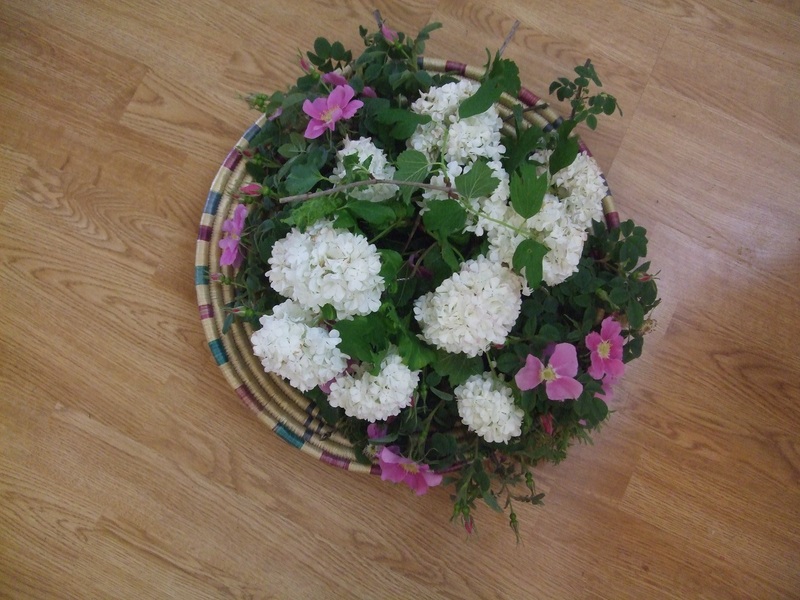 I even picked the flowers onto this round flat basket instead of a cracked ice cream bucket like usual. 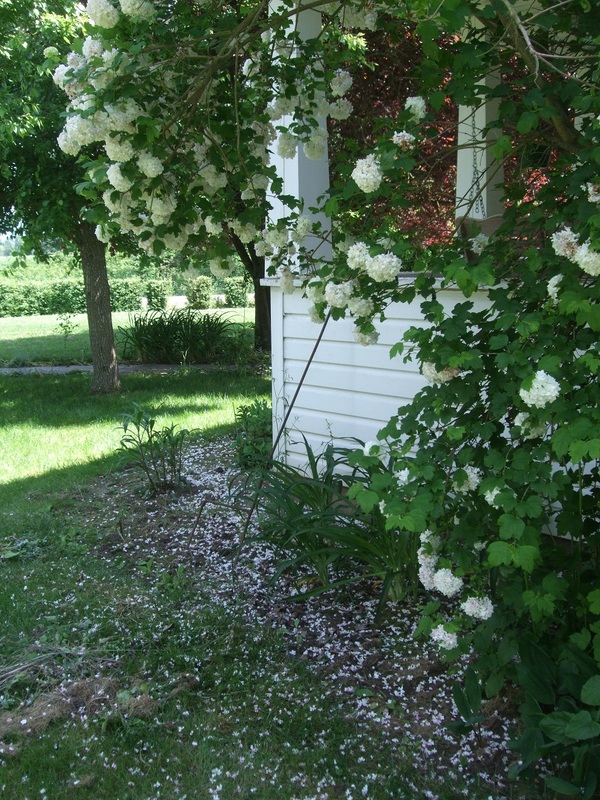 But seriously, how pretty is the snowball tree, and white dusting of petals on the grass, like sprinkled snow? Or powdered sugar? Or dandruff? Anyway, I was quite proud of my bouquet, and it made my room smell amazing. 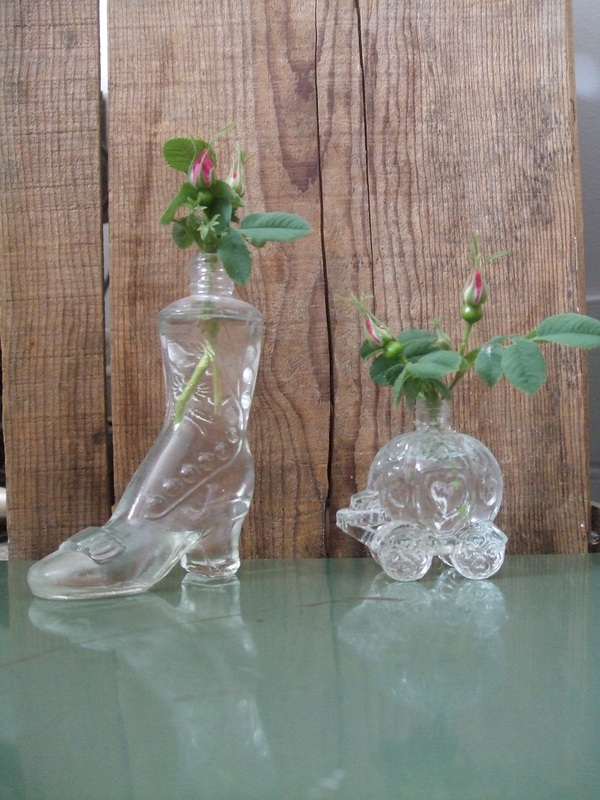 I put the leftover rosebuds in some vintage perfume bottles and they actually opened up, later, when I set them on the windowsill. That was nice. They didn’t die as quickly that way. As much as I love bouquet-making, I decided I’d rather appreciate Oregon’s beauty another way: by going on adventures. This summer, I’d like to visit various pretty/awesome spots in Oregon and blog about them. If you have recommendations for where to go, please don’t hesitate to comment! I love your bouquet of roses and snowballs in the tea kettle. Very pretty. I think beauty is all around us if we just pay attention. I became friends by internet about a dozen years ago with Virginia Swartzendruber from Oregon/Idaho. You may know her. She used to be a very talented photographer and travelled all over taking pictures and then blogging about it. I used to love reading about her adventures. I believe you have the capacity to be a great adventurer, too, and I know I would enjoy reading about it.